Parents! Are You Ready for Kindie Rock? 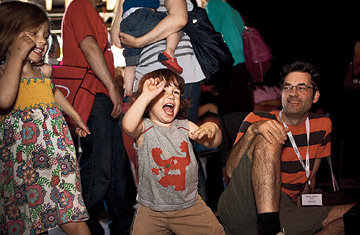 They Might Be Giants' Marty Beller looks on as his kids jam at Brooklyn's Kindiefest. At a hot new club in Brooklyn, the walls are throbbing, rocked by a blaring hip-hop band, Secret Agent 23 Skidoo, one of six acts in the day's lineup, which runs from punk to pop. If not for the high-pitched roar of the crowd  and the fact that many of the fans are under 4 ft. (120 cm) tall  this jamathon could easily be mistaken for any of the blissed-out shows I attended in my 20s. I'm here with one of my 6-year-old twin sons at the second annual Kindiefest, a three-day national conference  complete with panels, keynote address and performances  to exchange ideas on how best to market, distribute and play independent music for kids. (The genre, called kindie music, is proudly distinct from the bubblegum stuff on Radio Disney.) In the past couple of years, as the mainstream music industry has struggled, family music has exploded. Parents immune to the charms of Barney or Raffi now have dozens of options for CDs and concerts that they can enjoy as much as their kids can. More bands are making money and vying for limited space at cool venues like Washington's 9:30 Club and Eddie's Attic in Decatur, Ga. And their records are being played on a growing number of kindie radio shows from Detroit to Albuquerque. It's no longer seen as a sign of failure to be a performer for the 8-and-under set. Indie bands like Weezer and the Shins are showing up on the trippy kids' TV show Yo Gabba Gabba. Established musicians like Dan Zanes (formerly of the '80s band the Del Fuegos) and They Might Be Giants (which won a Grammy for the theme song for Fox's Malcolm in the Middle) are now better known for their kids' records. And some newer kindie artists who don't have grownup-music hits  or even children of their own  are recording and touring regularly as family performers. Recess Monkey, a trio of Seattle elementary-school teachers who performed at Kindiefest, started playing together just a few years ago. Now their intelligent, Beatlesesque sound is filling small venues in Chicago and on both coasts. A key part of a band's success is theatrical, goofy performances, but another reason for the music's popularity is that it's good. So good, in fact, that  I'll say it loud and proud  I often listen to family bands when my sons aren't around. Without any sugarcoating or condescension, the songs address a range of topics, from bullies and new haircuts to death and divorce. And the artists approach this territory with sophisticated harmonies and themes. "I was told when I started that a kids' song had to be sweet and repetitive, but I found that's not the case at all," says Justin Roberts, a brilliant crafter of power-pop songs who will release his seventh kindie CD, Jungle Gym, in June. "I write stuff that makes me feel something, and then I hope kids will like it too." Judging from the stage rushers at Kindiefest, the kids are finding it more than alright.